Make It With Wool Winner & Pendleton Tartan on the cover of Threads magazine! Kelsey Clear of Niles, Michigan, who learned to sew when she was only six years old, recently won First Runner Up honors in the Make It With Wool contest–and she did it with Pendleton wool. But not just any Pendleton wool! Kelsey sewed her winning look with our very own tartan, as registered with the Scottish Tartans Society. 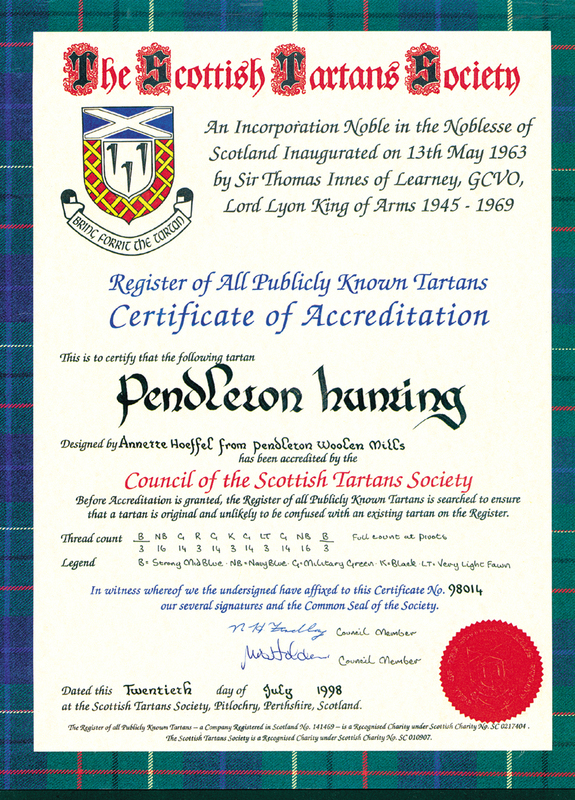 Pendleton Woolen Mills registered the official Pendleton Hunting Tartan with the Scottish Tartans Society in 1999. It was created to commemorate Pendleton’s roots in the Pacific Northwest and the many generations of family that have overseen Pendleton’s business through the years. The official company tartan also salutes the British Isles origin of Pendleton’s weaving heritage, thanks to our founder, Thomas Kay. And yes, that’s the very tartan bordering the certificate. For a closer look at the winning look, which includes more than just that adorable shirtwaist dress, pick up a copy of Threads today–we have it in stock at the store. Perhaps you’ll be inspired to sew your own project with Pendleton Hunting Tartan. We would love to see it!